After I learned to love gin years ago, it was many gin and tonics later that I decided to branch out into other gin concoctions. Of course, the classic is the gin martini. I tried it, but always looked forward to those olives that were soaking up the gin. I mentioned this to a bartender and he said I might want to try a dirty martini. And now to this day, I prefer the dirty over the traditional. 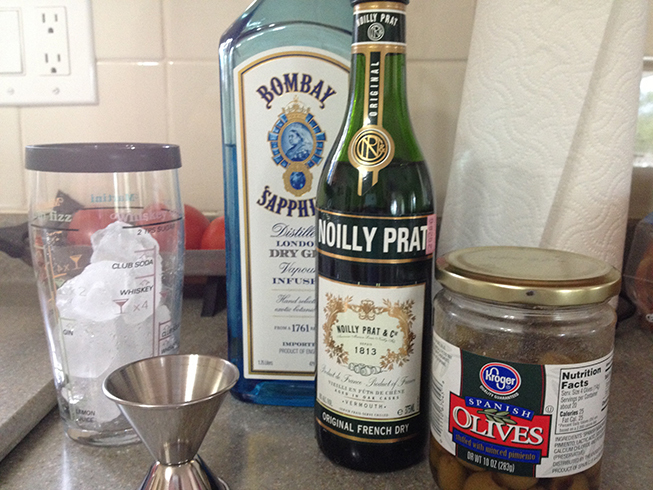 Just like making a traditional gin martini, you simply add in an extra ingredient: olive juice. First, fill a martini glass with ice. Then take a shaker, add half way with ice, add a splash of vermouth, let it sit for a minute. Then add two 1.5 oz jiggers of your preferred gin. For me, that’s Bombay Sapphire. Then pour in about 1.2 oz of olive juice. Shake vigorously then empty the ice from the martini glass and strain the contents into it. Add 4 olives [anything less seems criminal] and enjoy. As you can see from the photo above, the dirty martini is indeed dirty looking, no where near as clear as a traditional martini. This is obviously due to the olive juice. You can make it less dirty looking by waiting until after you’ve shaken the martini and strained it into the glass THEN adding the olive juice. This makes it less cloudy. 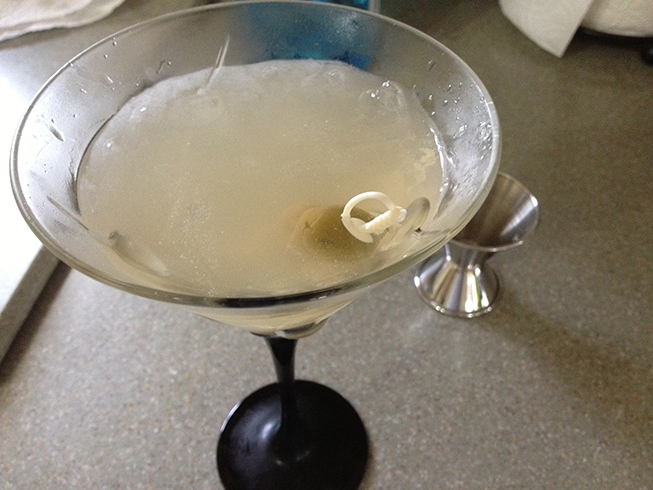 Also, for those that prefer their dirty martinis stirred, it makes them less cloudy. 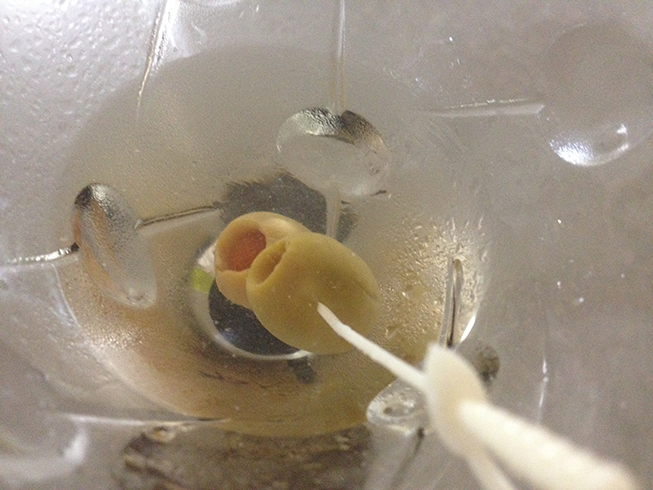 The reward at the end of the martini is to eat the olives that have been soaking in the gin. 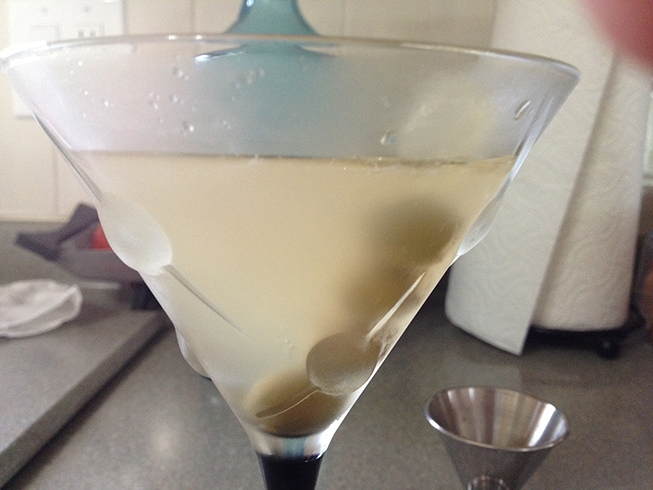 While I normally prefer the manzanilla olive, I only had the smaller spanish olives for this particular dirty martini. The manzanilla olives are larger and more meaty, which in turn, can soak up more gin. The result is magical, in a dirty sort of way. How do you enjoy your martinis? I agree with you and Dorothy as well… assuming the host is a lovely young woman.